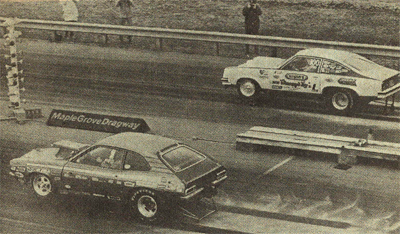 MAPLE GROVE DRAGWAY, Reading, PA – In a super close match race duel, Wayne Gapp just did nip Bill Jenkins two straight with Maple Grove record runs of 8.78 and 8.88. “The Grump” hit second best times of 8.88 and 8.87 to make things really tight. MAPLE GROVE DRAGWAY, Reading, PA – Maple Grove Dragway braved predictions for blustery, cold winds and possible snowfall and opened it gates to a surprisingly large turnout of fans and racers alike. Highlighting the event was the best-of-three go between Winternationals Pro Stock finalists Bill “Grumpy” Jenkins and Wayne Gapp. The somewhat sparse grandstands became jam packed as many of the fans gave up the heated comfort of their cars for a look at Jenkins’ all-new 1974 Vega and the World Finals winning Pinto of Gapp. Following the usual burn-out rituals. Jenkins and Gapp staged up for their first round encounter. Jenkins seemed to grab a slight early advantage, but Gapp overpowered the Vega nearing the finish for a record 8.78, 152.58 to 8.88, 152.54 round win. In the second and final round, Gapp parlayed a hole shot into victory despite losing an engine near the finish line. Gapp’s 8.88, 147.54 held off Jenkins’ fast-closing 8.87, 152.54. It should be noted that both cars were about 200 pounds lighter than legal weight.